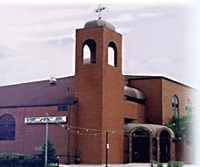 St. John the Baptist Greek Orthodox Church was built in 1981 during the presidency of the late Dr. Leonidas Polymenakos. Located on Warden, south of Ellesmere, it is ideally located in the heart of Scarborough, easily servicing area residents. Unfortunately, in January 1991, a fire completely destroyed the Church. The fire and destruction of the Church did however have very positive results. "Ouden kakon ameiges kalou" means "In every bad happening, there is something good". It showed the strength of our community as everyone rallied behind the Church and the Greek Community to have the Church rebuilt. Services were conducted in the Youth Centre gymnasium while the Church rebuilding continued until December of the same year. A group of ten Orthodox Russian iconographers were responsible for the iconography and the final result was a magnificent Church. Decorating and servicing our city, we are thankful to God for it is one of the most attended Greek Orthodox Churches in all of North America. The Church has two main entrances, an elevator and a seating capacity of 450. During large feast days, the Church has been able to accommodate an additional 400 people. The multi-purpose room is available for community events. For more information and reservations, please contact the St. John's office at 416-759-9259. The Church executive council is comprised of the President, vice-president, Secretary, Treasury and the parish Priest. The remaining body of the Church council encompasses the many volunteers that attend services on a regular basis. 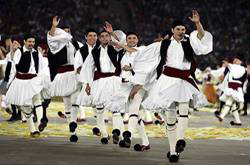 The President represents the Church council at the Greek Community’s General and Executive meetings and together with the entire council strengthen their weekly programs. Since 1981, there have been many volunteers elected to the challenging position of Church president. The Community thanks them, and their councils for their work and the strong foundations they have created.